We departed the following morning in slighter brighter and drier conditions, having made a prompt call to the lock controllers at 9am. Our first two locks were opened efficiently by a cheery attendant, whilst the third was manned by a student whom we found asleep in his car. After about 10 minutes he was somehow alerted to our prescence and came stumbling to open the gates, fastening his lifejacket with one hand and carrying the lock handle in the other. His profuse apologies were presumably designed to safeguard his position. 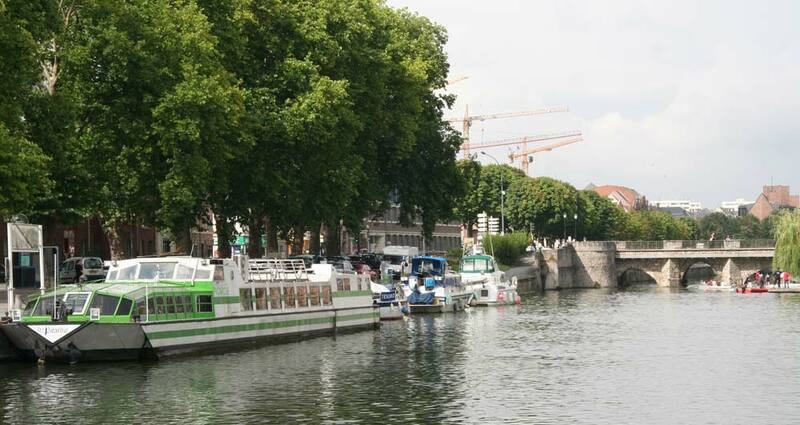 Our destination for the day was Amiens, regional capital of Picardie, which has good mooring facilities close to the town centre. Whilst the moorings were provided free, the water and electricity were dispensed by a complex electrical token system, in which you bought six units at the tourist office, which could each be 3 hours of electricity, or 200 litres of water. There were only a handful of boats at the Pont Amont of which we were surprised to find two were Brooms, one of whom we had met before in Limehouse. David and Jill on Summer Celebration were on their way upstream so it was useful to compare notes of our respective voyages. We were even more surprised the next day when a fourth Broom, Samphire, turned up. Arriving from upstream at Amiens, we were able to catch a glimpse from the river of the 'hortillonages'. 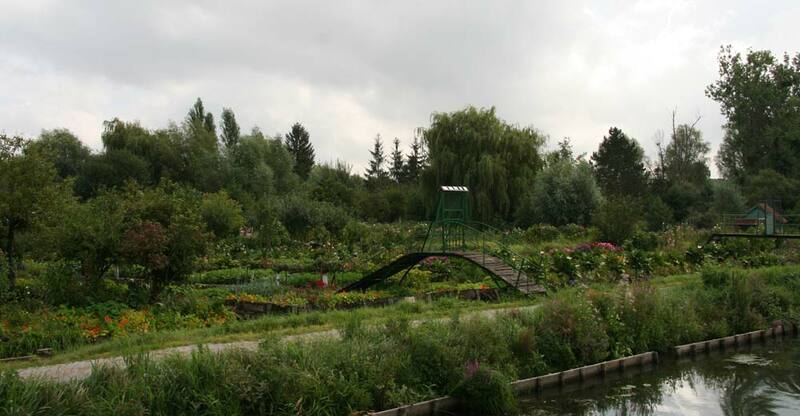 Accessible only by small boat, this network of market and ornamental gardens covers 300 hectares. Traditional horn-shaped boats tour the area but with wet weather dogging our stay in the city an opportunity for a visit did not present itself. 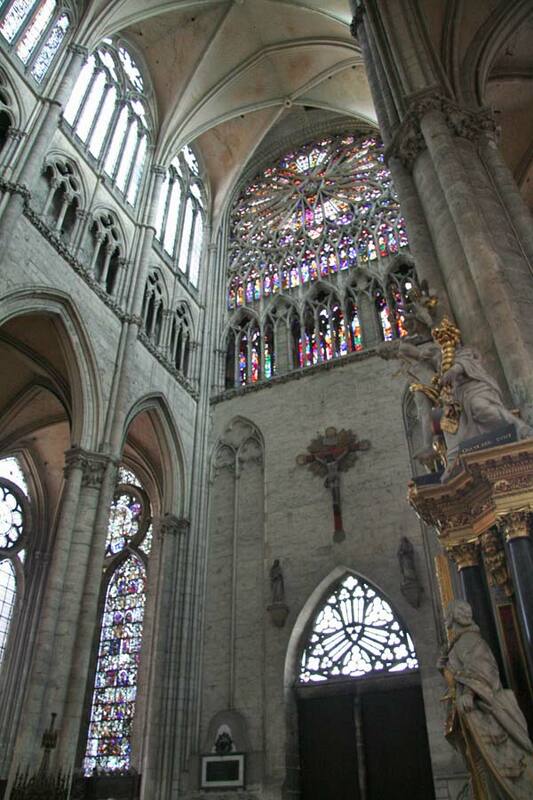 A more popular visit in the steady rain was the interior of the 12th century cathedral. Covering an area of 7,700 square metres, it is the largest in France, although the upkeep of the interior struggled to match the grand scale. Each evening the exterior of the cathedral is brought to life with a 'son & lumiere' performance, depicting the statuary of the facade in vivid colours. The colours transform the stone figures into human characters, who tell the story of the town in the context of its religious history. Other attractions in the city include the house of Jules Verne, who lived in the city and wrote many of his most famous works, including Around the World in 80 days, from his home in Rue Charles-Dubois. Amiens Plage should have been a glimpse of the seaside in the summer city, but in the inclement weather just a few hardy souls in raincoats were determinedly trying out the isolated deck chairs. And on Quai Belu in the old St Leu quarter the canalside restaurants which should have been buzzing with life were windswept and deserted. In Blackpool we call it lights weather!